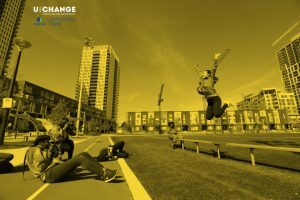 U For Change | UforChange Chosen as one of the Finalists for the Aviva Community Funds Competition! 11 Oct UforChange Chosen as one of the Finalists for the Aviva Community Funds Competition! Vote here. The public can vote from October 10, 2017 – October 19, 2017. Congratulations to UforChange on getting chosen as one of the finalists for the Aviva Community Funds Competition! The Aviva Community Funds Competition is a project that started 8 years ago to invest in charitable community initiatives across Canada to help them achieve their goals. They help community initiatives protect the people, support the causes that the public care about and strengthen local communities. They have provided more than 7.5 million dollars in project funding to date and they’re working hard to donate more to new and upcoming community initiatives this year and years to come. UforChange proposed an idea to offer a new element to our Core Arts Program in the form of Business Labs. Working with Business in the Streets, our partner in this endeavour, our proposed curriculum for our Business Labs has been divided into three sections: Personal Skills Development, Professional Skills Development and Entrepreneurship. Workshops will be sequential, building on the information from the class prior. We will record each session and post our content online so that our reach is expanded to more youth and not limited to those who have been accepted into our program. Purchase additional hardware such as computers, cameras, and sound equipment to have more youth participants who can use equipment at their own pace. Hiring additional mentors so we can offer up more spaces for applicants and have more one on one coaching with the youth. Bring in workshop leaders from local agencies who specialize in the topics covered in our curriculum. We can not do this without the support of our community! Please vote for us so we can have the opportunity to serve our community better!